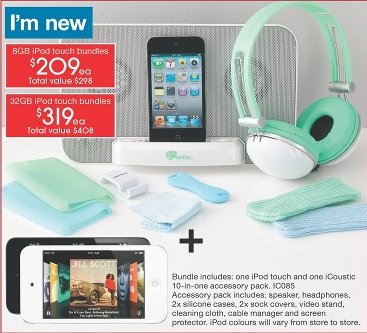 Target is kicking off a brand new iPod Touch bundle with all new accessories for cheaper than the RRP of the iPod Touch alone! 10-in-one accessory pack (Speaker, headphones, cases, covers, video stand, cleaning cloth, cable manager and more). 8 GB iPod Touch bundle: $209 (total value $298). 32 GB iPod Touch bundle: $319 (total value $319). Offers start 25th and go for a week including Australia Day!